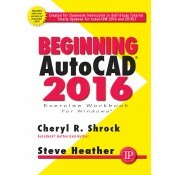 Beginning AutoCAD 2016 Exercise Workbook is the right book for users new to AutoCAD or who want to brush up on the basics. This is a clear, no nonsense, easy-to-follow text that helps user learn AutoCAD quickly and easily. All exercises print easily on a standard 8 ½” x 11” printer. 8 1/2” x 11” paper) for practicing the commands you just learned. Start very simple and progress to higher level skills. Introduce you to the drawing commands first. Show you how to create your own setup drawings. Start Tab page, containing two sliding content frams called Learn and Create, enabling you to quickly access recent drawing files, templates, product updates, and online resources. DIM command, allowing you to create dimensions based on a selected object. Text Frame property, used to easily create a border around text. Rectangular and Polygonal Revision Clouds. The Command Preview also is enhanced to allow for the Blend, Erase, Scale, Stretch, and Rotate commands. proved graphics include Line Smoothing and the display of perfect curves. â€‹Steve Heather has 30-plus years of experience as a practicing mechanical engineer and has taught AutoCAD to engineering and architectural students at the college level. He is an authorized AutoCAD beta tester and a member of AutoCAD Connected Desktop Customer Council.